Thought I would share some wonderful images of the last beach walk I took in 2015 for all of those reminiscing about their holiday beach vacations. I started at the South Beach Pavilion in Boca Raton, and walked north towards Red Reef Park. The beach in front of the pavilion is usually concentrated with people, and this day was no different. (This is a favorite spot for the FAU students.) Despite all of the people, I was able to capture so very relaxed gulls. I also saw man-o-war aplenty, so beware if you are swimming in the South Florida region! I took all of these images with my phone. Enjoy! Looking south towards the South Beach Pavilion in Boca Raton. A group of cute seabirds! Look how well the birds camouflage with the sand. A washed-up man-o-war. Be careful, they can still sting you! These gulls were lulled to sleep by the ocean breeze. The waves were choppy, but not too intense. Great for bodysurfing or learning how to surf. Always watch out for rip currents! If you are looking for a fun, educational experience near the beach, and you love sea turtles, then you must check out Gumbo Limbo Environmental Complex in Boca Raton, Florida. Located on A1A across from Red Reef Park, Gumbo Limbo gives you an up-close look at what is going on under the sea and then some. The complex consists of a butterfly garden, an indoor nature center, classrooms, a turtle rehabilitation center, large outdoor aquariums, and a mangrove boardwalk. There is also a gift shop.The twenty-acre property is situated on the intracoastal, so whether you go through the butterfly garden or the mangrove boardwalk, you will be able to see the beautiful waterway. *Tip* Park at Red Reef Park and walk across A1A if you plan on going to the beach (Parking is $16 weekdays, $18 on weekends and holidays). You can also park across from Red Reef Park at the Red Reef West Park, use the same entrance as the Red Reef Public Golf Course. Parking there is $2 an hour weekdays and $3 an hour on weekends. There is access from the parking lot to Gumbo Limbo’s boardwalk. Throughout the indoor/outdoor nature center, you will see a variety of wonderful nature exhibits. There is a gopher tortoise exhibit, a butterfly nursery, local plants potted throughout, and other thought-provoking exhibits that focus on how humans impact the environment. Gopher tortoises burrow deep into their hole. In the wild, these burrows provide homes for over 300 different species. This exhibit illustrates the lights that can negatively impact a sea turtle’s course, while also showcasing recommended artificial lights. These gopher tortoises continue to burrow. The longest recorded gopher tortoise burrow is 47 feet long! One of the greatest things about Gumbo Limbo is the work that they do in terms of sea turtle rehabilitation and conservation. In 2010, their new rehabilitation center opened, a state-of-the art facility that provides refuge for sick and injured sea turtles. Talk to any of the volunteers or employees, and they will gladly teach you about all of the turtle patients receiving treatment. There is even a window where you can watch a turtle receive treatment. I witnessed a turtle receiving IV fluids. It is heartbreaking to see turtles missing parts of their shell due to boat collision accidents, or their bodies covered in fibropapillomatosis. However, it is wonderful that places such as this exist to offer these sea turtles a second chance. *Tip* No flash photography is allowed in the sea turtle rehabilitation facility. Entry to the Sea Turtle Rehabilitation facility. In each of these tanks, is a sick or injured sea turtle. This interesting chart outlines the health and treatment plan for each patient in the rehab facility. The newest additions to Gumbo Limbo are their sea tanks. There are four large tanks, each of which represents a different coastal ecosystem. Two shallow tanks are in one pavilion, and two large tanks are in an adjacent pavilion. One shallow tank represents a mangrove ecosystem, and the other a nearshore reef. In this room you will see stingrays cruise by, fish, and other sea surprises! Stingray cruising by in the mangrove tank. In the pavilion with the large tanks, there is a tropical coral reef tank and a shipwreck tank! You can marvel at the beautiful colors of the coral reef, or gasp when a baby shark swims up to the glass right in front of you. This is a great way to show kids what is going on beneath the waves. A corner of the shipwreck tank has a step for little kids to use so that they can easily peek through the glass. *Tip* Visit Red Reef Park in the morning and enjoy the beach and artificial reef, and then walk to Gumbo Limbo during the heat of the day. The boardwalk at Gumbo Limbo is a peaceful, shaded quarter-mile path that takes you through the mystical mangroves. Go slowly, tread quietly, and you will be surprised at the abundance and diversity of wildlife to see. 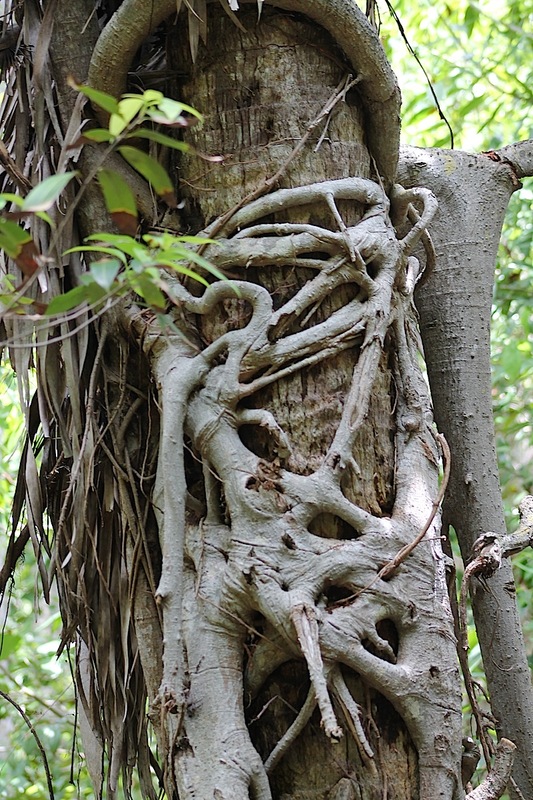 There are many amazing plants throughout the boardwalk as well, from mangroves to the eponymous gumbo limbos, from strangler figs to cabbage palms. One of the most incredible things about the boardwalk is the forty-foot tall observation tower that takes you above the coastal hammock to give you a bird’s eye view of surrounding Boca Raton. 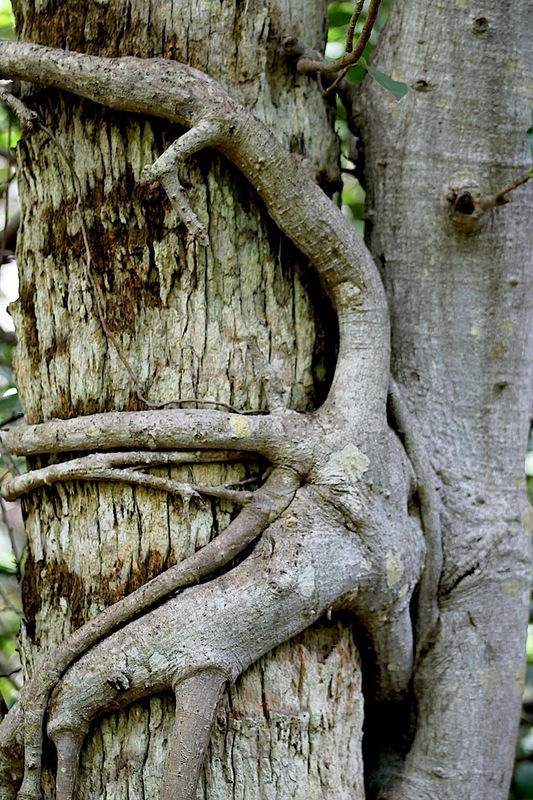 Overall, Gumbo Limbo Environmental Complex is a great day trip whether you are alone, a couple, or a family. When you enter the hammock boardwalk you quickly forget that you are in the heart of coastal Boca Raton. 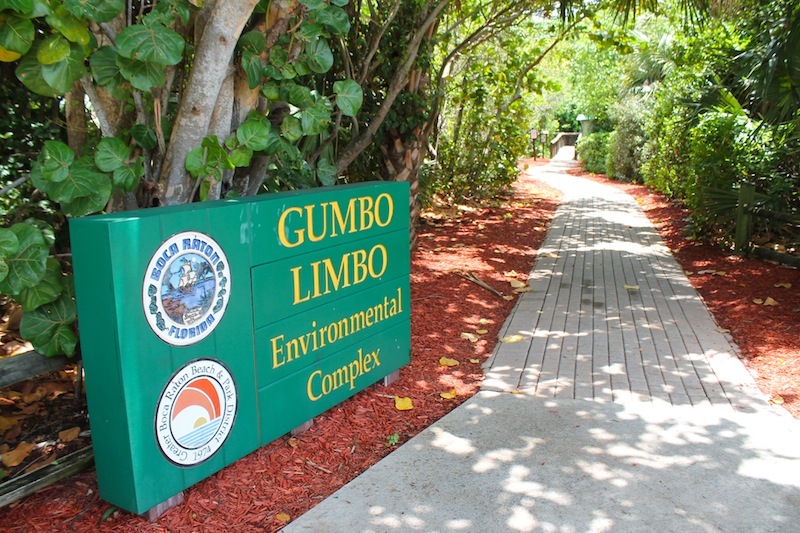 To learn more about Gumbo Limbo or to volunteer, visit their website. Find out about the problems we discovered on our walk along the Gumbo Limbo Coastal Hammock boardwalk.